In a remote corner of northwest Kenya, 800km from the capital Nairobi, lies a sprawling urban settlement built from tin sheet and tarpaulin provided by various UN agencies. Kakuma, the name shared by a town and one of the largest refugee settlements in Africa, is a remote place in a geographic, moral and economic sense; in Swahili, the regional language, Kakuma simply means ‘Nowhere’. On the one hand, it is a place of respite from conflict and famine for tens of thousands of inhabitants. On the other, it represents a kind of limbo. Peace is fragile and temporary programmes fail by definition to deliver permanent development. Unsurprisingly, then, long-term refugees cannot progress from emergency aid to programmes that allow them to develop the rights, freedoms and capabilities they need to build a life of value. Take the example of Grace (a fictitious name), wrapped elegantly in a bright red sarong, deftly moving around her hair salon on one of Kakuma’s dusty shopping streets, her baby cradled, sleeping, on her back in a colourful shawl. Having washed her customer’s hair, Grace disappears outside for a moment. She reappears a moment later heaving a petrol generator into the room, which, still with a baby sleeping on her back, she soon has spluttering into life, a hairdryer connected, and a happy customer made. When identities are surrendered and lost to a life constructed by aid agencies, Grace’s shop allows the women that come through the door the chance to take comfort in the gentle hair washing and to affix one of the hundreds of hair extensions for sale to their head for a fleeting moment of ‘normality’. Grace, like countless refugees, mesh together the little international assistance they receive – aid and remittances – to create a life they have reason to value. Yet, despite their tireless efforts, they are likely to remain residents for the foreseeable future; a permanent solution to a temporary problem. For Grace, and the 200,000 like her in Kakuma camp and nearby Kalobeyei settlement, existence means relying on basic needs provision by a patchwork of actors. The majority of the camp’s inhabitants rely on small monthly disbursements of flour, beans and pulses for their sustenance, supplemented by a cash-based transfer called Bamba Chakula – which gives households between USD $3 and $5 per person per month depending on household size. This tableau of precariousness and temporariness is found along many borders around the world. Identities are exchanged for media narratives; the freedom and capabilities of refugees are exchanged for basic needs provision. International aid agencies and their loyal field teams work tirelessly for these people, and the dedication they have to their wards is admirable. But their commitment might not be enough. Creating a framework for humanitarian social protection means bringing those at the margins into the realm of rights and empowerment. At the same time, though, it also means accepting that the narrative of return can sometimes hinder long-term planning. 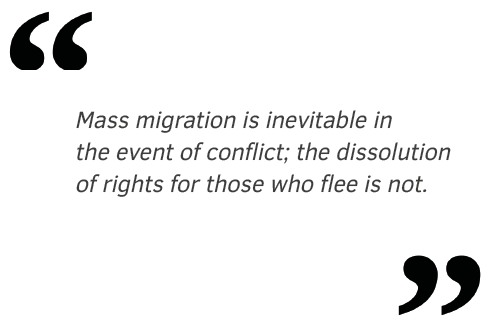 Mass migration is inevitable in the event of conflict; the dissolution of rights for those who flee is not. By envisaging the long-term strategy to deliver a rights-based social protection scheme to those who flee ensures a pro-active approach with sustainable funding and the possibility of progress. With a structure in place, essential emergency aid becomes but the first step on a journey to realising long-term rights and development, rather than an eternal churn of programmes and projects whereby needs are assessed as a collective whole, rather than allowing individuals the chance to create the patchwork structure they need to meet their needs. Policies that point in a progressive direction are developing around the globe, and the example of Uganda is probably the most well-known. One of the world’s poorest countries, Uganda has adopted one of the most advanced and open refugee policies in the international community. The country allows refugees to own land and start businesses within the country, allowing them to benefit from national social protection schemes. It recognises refugees as actors of change in charge of their own destiny! Not only do they help refugees to shape their own futures, the government of Uganda and UNHCR work to reduce poverty and mitigate risk among both vulnerable refugees and their host communities. There are also a number of national social protection programmes that are shadowed by international actors. In Turkey, the EU Emergency Social Safety Net (ESSN) for Syrian refugees is run through Turkey’s existing social assistance offices and provides individuals with cash transfers comparable to national social protection schemes. In Mali, NGOs funded by the European Commission department for Civil Protection and Humanitarian Aid Operations (ECHO) delivered cash transfers to refugees in 2014 and 2016. They were able to harmonise the programme within the various organisations and the Malian Jigisèmèjiri cash transfer programme. Social protection within many Western nations has helped create more just societies, free of the inequalities and ills described in 19th century reportage. It is now time to help the tens of millions living in deplorable conditions outside the current paradigm of protection. We can no longer feign innocence or moral absolution. We can no longer feign ignorance. Too many lives are at stake — this is our collective moral responsibility. Alex Hunns is a Research Assistant who focuses on Social Protection, Inclusive Innovation and Development. He is presently conducting research into social schemes protection across Uganda, for among others the UN Food and Agriculture Organization and the World Food Programme.